Present Position: Professor of Chem. Engineering & Industrial Chemistry, and Chair. Ph.D., Loughborough University, Leceistershire, United Kingdom. Polymer Engineering. B.Sc.(Hons. ), Southbank University, England. Chemical and Polymer. Licentiate Certificate, The Plastics and Rubber Institute, England. City and Guilds of London Certificate in Plastics Technology, England. Cape Breton, University, Sydney, Nova Scotia. 1998-2003 Chemical Engineering Instructor, Department of Physical and Applied Sciences, Cape Breton University, Sydney, Nova Scotia. Taught General Chemistry, Industrial Chemistry, Instrumental Analysis and chemical engineering fundamental courses. 1996-1998 Canadian Commonwealth Research Fellow, Department of Chemical Engineering, Lakehead University, Thunder Bay, Ontario, Canada. Research work was on the viscosity of bitumens, heavy oils, light crude oils, lubricating oils and crude oil fractions financed by CIDA, AOSTRA and NSERC. 1991-1993 Postdoctoral Fellow, Department of Chemical Engineering, Lakehead University, Thunder Bay, Ontario, Canada. Conduct research on viscosity and upgrading of bitumen. Taught Chemical Engineering Science, Applied Chemical Engineering Thermodynamics and Engineering Chemistry. 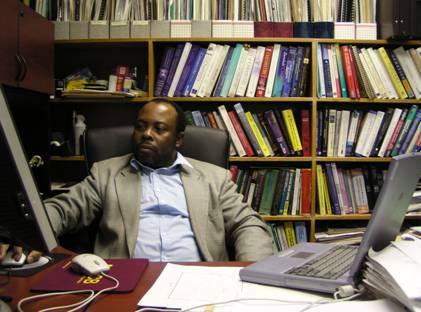 1991-1996 Associate Professor, Department of Chemical/Petrochemical Engineering, University of Science and Technology. Port Harcourt. Nigeria. 1986 -1991 Asst. Professor, Department of Chemical/Petrochemical Engineering, University of Science and Technology. Port Harcourt. 1985-1986 Lecturer, Department of Chemistry, University of Port Harcourt. 1984 -1985 Technical Officer, Mundet Plastics PLC, Surrey, England. 1981 -1983 Teaching Assistant and Laboratory Instructor to graduate students and short courses participants during my doctoral program. Teaching demands continuous updating like all things in life with technological changes, as it is engrossed in etiquette, mentorship, and professionalism. In my nearly two decades in the teaching profession I have successfully kept pace with these changes through incorporation of innovative instructional approaches into the traditional professor-centred lecturing approach. One aspect of my innovative approaches involves the active participation of students in class learning. Classroom lectures are interspersed with brief exercises whereby students work in small groups or individually on a variety of tasks based on the lecture. Perhaps, the most important aspect of my teaching is that I strive to impact into my students, confidence, trust and dynamism as components of success. My research has centred on the rheological characterisation and mathematical modelling of transport properties of complex fluid mixtures and polymeric materials. Currently my research focus is on developing an understanding of the role of asphaltene during viscosity reduction of bitumen and heavy oils in petroleum solvents, which has applications in reservoir simulations, enhanced recovery, pipeline transportation, upgrading and refining of crude petroleum. Processing-structure-property interaction in polymer and polymer blends. Viscosity correlations of crude oils, bitumen and lubricant systems as influenced by temperature, pressure and additives compositions. Upgrading of bitumen, heavy oils and petroleum residues using in-situ chemical reaction technique with free radical species. Chemical Engineering Research Group, 2005. 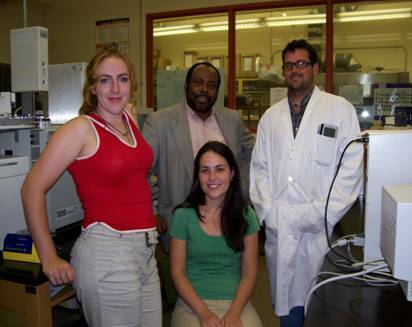 Chemical Engineering Research Group, 2004. Dr. Adango Miadonye, Levi Evans. 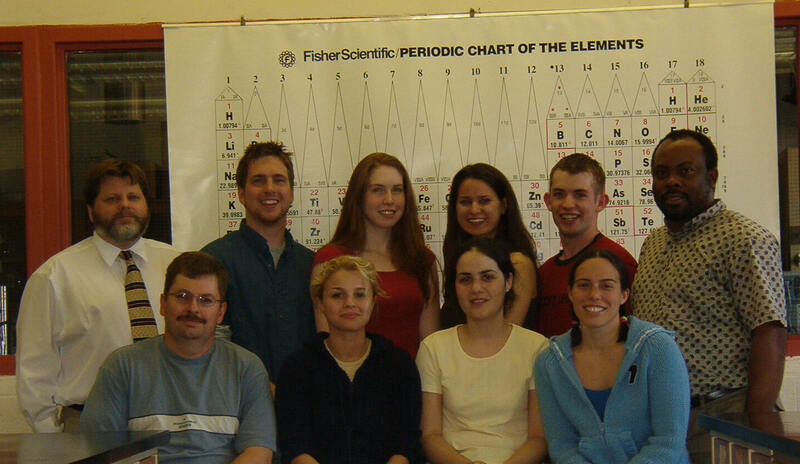 Chemistry Research Group, summer 2003. Lori Jessome, Shaun McInnis, Dr. Adango Miadonye. Front row: Dr. Dale Keefe, Victoria Whiffen, Ashley Parsons, Jennifer MacDonald. Member: Institute of Materials Engineering, United Kingdom. Member: Society of Petroleum Engineers. 62. Miadonye A, and L. D’Orsay, "Correlation for Estimating Temperature Effect on the Viscosity of Light Hydrocarbon Solvents", submitted, Journal of Materials Engineering and Performance, September 2005. 61. Miadonye, A, and L. Evans, “Solubility and Viscosity Relationships of Hydrocarbon Solvent Mixtures”, submitted, Chemical Engineering Communications, September 2005. 60. Miadonye, A, Parsons, A, and A. J. Britten, “Studies of Asphaltenes Precipitation in Bitumen-Hydrocarbon Blends”, in preparation. 59. Miadonye A, and L. D’Orsay, “Correlation for Estimating the Effects of Temperature and Pressure on the Viscosity of Light Hydrocarbon Solvents”, in preparation. 58. Miadonye, A and V. R. Puttagunta, “Gamma Radiation Assisted Upgrading of Bitumen”, in preparation. A. Peer Reviewed Papers in Reference Journals. 57. Miadonye, A. L. Evans and T. M. McKenna, “Study of Asphaltene precipitation in dilute Solution by Calorimetry” accepted for presentation in the International Conference on Multiphase Flow, Portland, Maine. Nov. 2-4, 2005; and publication I WIT Transactions on Modelling and Simulation. 56. Parsons, A; McKenna, T. M, and A. Miadonye, “Viscosity Model for Gases”, Petroleum Science and Technology, accepted for publication, May, 2005. 55. Britten, A.J., Whiffen, V. and A. Miadonye, “Heavy Petroleum Upgrading by Microwave Irradiation”, WIT Transactions on Modelling and Simulation, Vol. 41, pp.103 112. 2005. 54. McKenna, T. and A. Miadonye, “Viscosity Model for CO-Noble Gas Mixtures at Atmospheric Conditions”, Petroleum Science and Technology, in press, Jan. 2005. 53. Miadonye, A. and T. M. McKenna, "Viscosity Model for Pure Gases at Atmospheric Conditions", Journal of Materials Engineering and Performance, Vol. 14(3), June 2005. 52. Miadonye A., and W. Clyburn, “Modelling the Viscosity of Natural Gas Mixtures”, Computational Methods and Experimental Measurements, Vol. XI, p. 63-73, edts. Brebbia, C.A; Carlomangno, C.M and P. Anagnostopoulos. Pubs. WIT press. Southampton, UK. 2003. 51. Miadonye, A., N. Doyle, A. Britten, N. Latour, and V.R. Puttagunta, Modelling Viscosity and Mass Fraction of Bitumen-Diluent Mixtures, J. Can. Pet. Tech., 40(7), 52-57, July 2001. 50. Miadonye, A. and A. Britten, "Generalized Equation Predicts of Viscosity of Heavy Oil-Solvent Mixtures". Computational Methods and Experimental Measurements, edts. Esteve et.al, Vol. 10. pp. 165-177. Pubs. WIT press. Southampton, U.K. 2001. 49. Miadonye, A., N. Latour, and V.R. Puttagunta, A Correlation for Viscosity and Solvent Mass Fraction of Bitumen-Diluent Mixtures, Petroleum Sci. & Tech., 18(1&2), 1-14, 2000. 48. Miadonye, A., V.R. Puttagunta, "Modeling the Viscosity-Temperature Relationship of Nigerian Niger-Delta Crude Petroleum", Petroleum Sci. & Tech., 16(5&6), 627-638, 1998. 47. Miadonye, A., V.R. Puttagunta, R. Srivastava, S.S. Huang and Y. Dafan, "Generalized Viscosity Model for the Effects of Temperatures, Pressure and Gas Composition", J. Can. Pet. Tech., 36(1), 50-54, (1997). 46. Wallace, D., D. Henry, A. Miadonye and V.R. Puttagunta, "Viscosity and Solubility of Mixtures of Bitumen and Solvent", Fuel Sci. & Tech. International, 14(3), 465-478, (1996). 45. Miadonye, A., B. Singh, and V.R. Puttagunta, "Viscosity Estimation for Bitumen-Diluent Mixtures". Fuel Sci. and Tech. International, 13(6), 681-698 (1995). 44. Miadonye, A., B. Singh, S.S. Huang, R. Srivastava and V.R. Puttagunta, "Modelling the Effect of Dissolved Gases on the Viscosity of Heavy Oils", Chem. Eng. Res. and Design, 73(A2), pp. 208-213, (1995). 43. Miadonye, A., B. Singh and V.R. Puttagunta, "Modelling the Viscosity-Temperature Relationship of Alberta Bitumens", Fuel Sci. and Tech. International. 12(2), 335-350 (1994). 42. Singh, B., A. Miadonye, S.S. Huang, R. Srivastava and V.R. Puttagunta, "Estimating Temperature and Pressure Effects on Viscosity of Saskatchewan Heavy Oils," Fuel Sci. & Tech. International. 12(5), 693-704 (1994). 41. Miadonye, A., B. Singh, and V.R. Puttagunta, Comment on the Prediction of the Viscosity of Liquid Hydrocarbon and Their Mixtures as a Function of Temperature and Pressure. Can. J. Chem. Engr. 72(3), 558-560 (1994). 40. Puttagunta, V.R., A. Miadonye and B. Singh, "Correlation of Bitumen Viscosity with Temperature and Pressure", Can. J. Chem. Eng. 71(3) 447-450 (1993). 39. Singh, B., A. Miadonye, and V.R. Puttagunta, "Heavy Oil Viscosity Estimation From One Test", Hydrocarbon Processing. 72(8), 157-162 (1993). 38. Miadonye, A., V.R. Puttagunta and B. Singh, "Viscosity Modelling of American Crude Oil Fractions", Fuel Sci. and Tech. International. 11(10), 1483-1507 (1993). 37. Puttagunta, V.R., A. Miadonye and B. Singh, "A Simple Concept for Prediction of Viscosity of Heavy Oils and Bitumens", Oil and Gas J. 91(9), 71-73 (1993). 36. Miadonye, A., V.R. Puttagunta and B. Singh, "Prediction of the Viscosity of Crude Oil Fractions from a Single Measurement", Chemical Engineering Communications. 122, 195-199 (1993). 35. Singh, B., A. Miadonye and V.R. Puttagunta, "Modelling the Viscosity of Middle-East Crude Oil Mixtures," Ind. & Engr. Chem. Res. 32(9), 2183-2186 (1993). 34. Puttagunta, V.R., A. Miadonye and B. Singh, "Viscosity-Temperature Correlation for Prediction of Kinematic Viscosity of Conventional Petroleum Liquid", Chem. Eng. Res. and Design. 71(A6), 627-631 (1992). 33. Miadonye, A., "Processing-Structure-Thermomechanical Property Relationships of Unplasticised PVC Dry-blend", Indian Journal of Technology; 29(5), 247-249 (1991). 32. Puttagunta, V.R. and A. Miadonye, "Correlation and Prediction of Viscosity of Heavy Oils and Bitumens Containing Dissolved Gases Part I: Alberta Bitumens and Heavy Oils Containing Pure Gases", AOSTRA Journal of Research. 7(4), 241-250 (1991). 31. Puttagunta, V.R., A. Miadonye, S.B. Dyer and S.S. Huang, "Correlation and Prediction of Viscosity of Heavy Oils and Bitumens Containing Dissolved Gases Part II: Saskatchewan Heavy Oils Saturated with Gas Mixtures", AOSTRA Journal of Research. 7(4), 251-258 (1991). 30. Miadonye, A., "Effects of Plasticisers on Properties of Rigid Polyurethane Foam", Nigerian Journal of Technological Research, Vol. 2, pp. 65-70 (1990). 29. Miadonye, A., "Influence of Processing Methods in Rigid Polyvinylchloride Compounds", Nigerian Journal of Applied Science, Vol. 8 Supplement, 1990. 28. Miadonye, A., "Mechanism of Stabiliser Distribution in Rigid PVC Profile", Indian Journal of Technology, 26(10), 487-490 (1988). 27. Hemsley, D.A., Higgs, R.P. and A. Miadonye, "UV Fluorescence Microscopy in the Study of Polyvinylchloride Powders and Extrudates", Polymer Communications, 24(4), 103-106 (1983). 26. Gilbert, M. Hemsley, D.A. and A. Miadonye, "Assessment of Fusion in PVC Compounds", Plastic and Rubber Processing and Applications, 3(4), 343-351 (1983). 25. Miadonye, A. and V.R. Puttagunta, "Viscosity Correlation for Unrefined Petroleum Liquid", Chapter 3 published in the 'Advances in Engineering Fluid Mechanics Series' edited by Nicholas P. Cheremisinoff, Gulf Publishing Company, Morganville, New Jersey, USA, 1996. 24. Miadonye, A., Singh, B and V.R. Puttagunta, "Viscosity of Bitumen, Effect of Pressure and Temperature". Encyclopedia of Chemical Processing and Design. Vol. 62. edt. John J. McKetta. p. 455-464, 1998. 23. Miadonye, A., Singh, B and V.R. Puttagunta, "Viscosity, Heavy Oils". Encyclopedia of Chemical Processing and Design. Vol. 63. edt. John J. McKetta. p. 1-10, 1998. 22. Miadonye, A., Singh, B and V.R. Puttagunta, "Viscosity, Heavy Oils and Bitumen". Encyclopedia of Chemical Processing and Design. Vol. 63. edt. John J. McKetta. p. 10-16, 1998. 21. Singh, B., V.R. Puttagunta, and Miadonye, A, "Viscosity, Prediction". Encyclopedia of Chemical Processing and Design. Vol. 63. edt. John J. McKetta. p. 55-63, 1998. **20. Miadonye, A. L. Evans and T. M. McKenna, “Study of Asphaltene precipitation in dilute Solution by Calorimetry” accepted for presentation in the International Conference on Multiphase Flow, Portland, Maine. Nov. 2-4, 2005. **19. Britten, A.J., Whiffen, V. and A. Miadonye, “Heavy Petroleum Upgrading by Microwave Irradiation”, Computational Methods and Experimental Measurements, presented at CMEM 2005 Conference in Malta, June 20-22, 2005. 18. Miadonye, A. and T. M. McKenna, "Empirical Viscosity Model for simple Gases" paper presented at the 54th Conference of the Canadian Society of Chemical Engineers, Calgary, Oct. 17-22, 2004. **17. Miadonye A., and W. Clyburn, “Modelling the Viscosity of Natural Gas Mixtures”, presented at the CMEM 2003 Conference in Hadikki, Greece, May 2003. 16. McKenna, T. M., A. Parsons, and A. Miadonye, “Equation for Estimating the Viscosity of Petroleum Gases” paper presented at the SPE-OTANS CORE Conference, Halifax, Nova Scotia. Oct. 8-10, 2003. 15. Pearson, G., Clyburn W., and A. Miadonye, “Viscosity Correlation for Natural Gas Liquids”, paper presented at the SPE-OTANS CORE Conference, Halifax, Nova Scotia. October 8-10, 2002. 14. AuCoin D., Doyle N, and A. Miadonye, “Viscosity Modelling Studies of Heavy Oil in different Diluent Systems”, 51st Canadian Chemical Engineering Conference. October 14-17, 2001, Halifax, Nova Scotia, Canada. **13. Miadonye, A. and A. Britten, "Generalized Equation Predicts of Viscosity of Heavy Oil-Solvent Mixtures". Computational Mechanics '2001 Conference, Seville, Spain. June, 2001. pp. 644-658. **12. Miadonye, A., N. Doyle, A. Britten, N. Latour, and V.R. Puttagunta, "Modelling Viscosity and Mass Fraction of Bitumen-Diluent Mixtures", 8th Saskatchewan Petroleum Conference, Paper No. 99-121. October 18 & 19, 1999, Regina, Canada. 11. Miadonye, A., N. Latour, and V.R. Puttagunta, "A Simple Correlation for Estimating the Viscosity of Bitumen-Diluent Mixtures and Mass Fraction of Diluent", 49th Canadian Chemical Engineering Conference. October 3-6, 1999, Saskatoon, Canada. 10. Miadonye, A., B. Singh, V.R. Puttagunta and W. Paryatmo, "Viscosity Estimation for Crude Petroleum Liquids", Proceedings of Int. Conf. Fluid and Thermal Energy Conv. '94. Bali, Indonesia, 1994, p.69-74. 9. Puttagunta, V.R., A. Miadonye and B. Singh, " A Correlation of Viscosity-Dissolved Gas Relationships of Bitumens and Heavy Oils", Proceedings of 43rd Can. Chem. Engr. Conf., Ottawa, Canada, October 1993, pp. 55. 8. Puttagunta, V.R., B. Singh and A. Miadonye, "One Parameter Correlation for Modelling the Viscosities of Crude Petroleum and Bitumens", Proceedings of the 17th Annual AOSTRA/University/Industry Seminar, Calgary, Canada. March 3-5, 1993, p. 65. 7. Puttagunta, V.R., A. Miadonye and B. Singh, "The Model for Prediction of Temperature and Pressure Effects on Viscosity of Bitumens and Heavy Oil". CMEM '93 Conference, Sienna, Italy. May 1993, pp. 644-658. 6. Puttagunta, V.R., A. Miadonye and B. Singh, "Viscosity Correlation for Heavy Crude Petroleum", Proceedings of First Inter. Non-Renewable Energy Sources Congr. Conference, Tehran, Iran. December 26-29, 1993, pp.680-690. 5. Puttagunta, V.R., A. Miadonye and B. Singh, "Viscosity Correlation for Crude Petroleum and Its Fractions", Invited paper presented at ASTM Annual Meeting, Kansas City, Missouri, USA, June 14-19, 1992. 4. Miadonye, A., "Effect of Processing Regime on Morphology of Polyvinylchloride", Polymer '91 Conference, Pune, India, 1991. 3. Miadonye, A., "The Role of the Chemical Engineer in Revamping the Economy of the Developing Countries", ANSTI Conference '90, Dar-Es-Salaam, Tanzania, September 1990. 2. Miadonye, A. and E.O. Oboho, "Medical Application of Plastics", Nigerian Society of Chemical Engineering, 17th Annual Conference, Port Harcourt, Nigeria, 1987. 1. Gilbert, M., D.A. Hemsley and A. Miadonye, RPI International Conference, PVC Processing II, Brighton, England, April 1983. 12. Whiffen, V., and A. Miadonye, Upgrading of Heavy Petroleum by Radiation Method: Evaluation of Parameters, RAP Grant Report # RAP-AM/VW-ENGR2004. Department of Physical and Applied Science, University College of Cape Breton, Sydney, Nova Scotia. August 2004. 11. Parsons, A.; A. J. Britten, and A. Miadonye, Phase Behavior of Asphaltene in Petroleum Liquids, RAP Grant Report # CHEM-USRA-AP/AM-2004-01. Department of Physical and Applied Science, University College of Cape Breton, Sydney, Nova Scotia. August 2004. 10. McKenna, T. M, and A. Miadonye, Correlation of Viscosities of Gases and Gas Mixtures, RAP Grant Report # UCCB-ENGR-AM/TM 001-03. Department of Engineering, University College of Cape Breton, Sydney, Nova Scotia. June 2003. 9. Zhang, J; Miadonye, A and V. R. Puttagunta, Viscosity Correlation for Simple Binary Liquid Mixtures. Report No. JZ.AM.VRP-99-1. Department of Chemical Engineering, Lakehead University. Thunder Bay, Ontario. May, 1999. 8. Miadonye, A and V. R. Puttagunta, Radiation Assisted Upgrading of Bitumen. Final Report. Imperial Oil Charitable Foundation. Edmonton, Alberta. July, 1998. 7. Miadonye, A and V. R. Puttagunta, "Viscosity Correlation of Nigerian Delta Crude Oils" Commonwealth Fellowship Report # 1, Ottawa, October 1996. 6. Miadonye, A., B. Singh and V.R. Puttagunta, "One Parameter Viscosity Correlations for Bitumens, Heavy Oils and Crude Petroleum". AOSTRA Agreement #889, Final Report, Edmonton, June 1993. 5. Miadonye, A., B. Singh and V.R. Puttagunta, "Extension of One Parameter Viscosity Correlation to Conventional Crude Oils and Their Mixtures". AOSTRA Agreement #889, Report #5, Edmonton, December 1992. 4. Puttagunta, V.R., and A. Miadonye, "Extension of One Parameter Viscosity Correlation of Heavy Oils and Bitumens Containing Dissolved Pure Gases". AOSTRA Agreement #889, Report #4, Edmonton, June 1992. 3. Puttagunta, V.R., B. Singh and A. Miadonye, "One Parameter Correlation for Prediction of Viscosity of Heavy Oils and Bitumens", AOSTRA Agreement #889, Report #3, Edmonton, December 1991. 2. Miadonye, A., "Waste Materials Management and Control". Report prepared for General Plastics (Nigeria) Limited, Port Harcourt, 1990. 1. Miadonye, A., "Ascertainment and Improvement of the Quality of Polyethylene Packaging Bag". Report prepared for General Plastics (Nigeria) Limited, Port Harcourt, 1988. 10. “Opportunities for Sustainable Economic Development in an LNG Industrial Community”, presented at the NLNG Stakeholders symposium in Chicago, IL. August 6, 2005. 9. “What Chemical Engineers do for a Living’. Presented to the Engineering Faculty and Students, St. Francis Xavier University, Antigonish, Canada. February, 2005. 8. “The Chemical Engineering Profession”. Orientation Week Presentation to year 1 students, Department of Engineering, University College of Cape Breton, Sept. 2000. 7. “Nigerian Bitumen:-Present and Future Economy Impact”. Canadian Commonwealth Research Fellow presentation to Rivers State University of Science and Technology Community, Port Harcourt, Nigeria. February, 1998. 6. "The Changes in Morphology of Polyvinylchloride during Extrusion Process". Seminar paper presented to Chemical Engineering Faculty and Students, organised by Department of Chemical Engineering, Lakehead University, Thunder Bay, Canada. November, 1992. 5. "The Influence of Bonny People in Nigerian Politics". Paper presented at the Political Aspirants Symposium organised by the Bonny Gentlemen's League, Women Hall, Bonny, August 1991. 4. 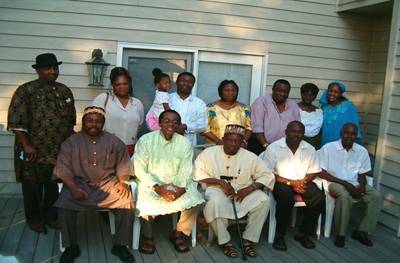 "The Effects of Oil Industry in the Social and Economic Activities of Bonny Community". Paper presented at the End of Year Symposium and General meeting of National Union of Bonny Students, University of Science and Technology Chapter, Orupolo Night Club, Port Harcourt, December, 1990. 3. "Investment Opportunities in the Downstream Petrochemical Industry". Paper presented to Industrialists and Investors Symp. Night, Port Harcourt, Oct., 1988. 2. "The Concept of University Admissions and Its effects in Nigerian Youths". Paper presented at the Inauguration of National Union of Bonny Students in Universities, Midland Hotel, Bonny, December, 1987. 1. "Plastics Materials from Downstream Petrochemicals". Paper presented at the 25th Anniversary of Metalloplastica Nig. Ltd., University of Science and Technology, Port Harcourt, August, 1986.
soccer, golf, lawn tennis, photography, fishing.